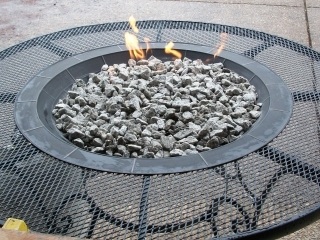 How To Build A Gas Fire Pit Table In 5 Basic Steps! 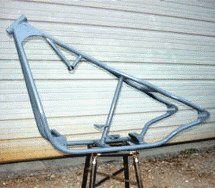 Davib B sent in a killer gas fire pit welding project on our welding projects area and we just had to get more details on this amazing project and he was gracious enough to send in the nitty gritty details on building this outdoor fire pit. 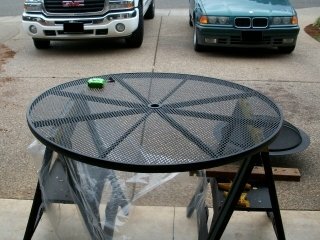 David's wife wanted an outdoor propane fire pit table. He told her to get one at the store but when she came back with a price tag of $1,200 he nearly dropped. 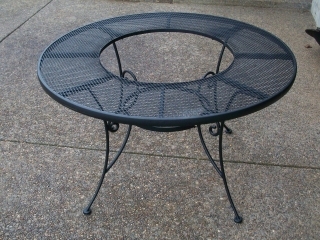 So he decided to build a gas fire pit table himself. He looked around at Coscto and Walmart for fire pits and fire tables to modify, or maybe even find a deal on a propane gas fire pit. Costco had something for $1,200 and Walmart has one for $700. 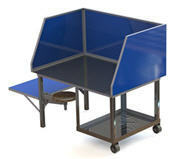 Each table has chairs, but the Walmart model is wood and you have to build the propane coil. He also thinks that it would be hard to fit a propane tank underneath the wood Walmart table. But he went to Lowe's and looked for something and found a garden patio table for just $88, a fire pit for $58, and chairs for $40 each (he waited on the chairs though). 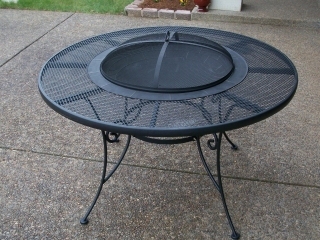 So he got the table, and fire pit. In addition he bought a box of Malleable 1/4 inch Copper tubing, a cap, and two reducers, and Copper pipe with couplings for the propane tank. He took all this stuff home and here's how to build a gas fire pit! He laid the table out on a couple of saw horses and began measuring for the hole to be cut. The bowl of the fire pit measured to be 25.25 inches. 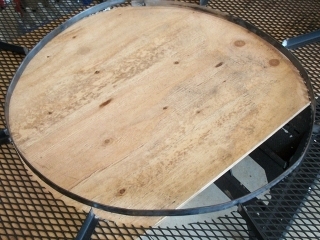 I cut a 25.5 inch hole in the center of the table using an air powered cut off saw. 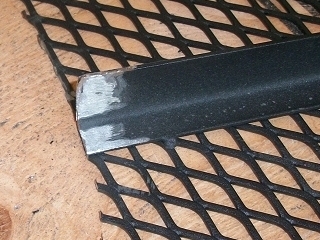 Once the hole was cleaned up, I ground (cleaned the paint off of) down the ends of the angle iron that was used for support under the table. 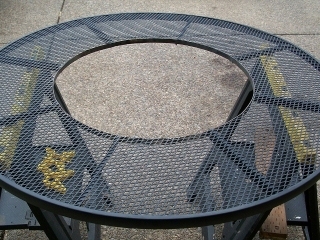 I went to the Local Scrap yard and bought 85 inches of flat bar, and bent it into a circle ring. 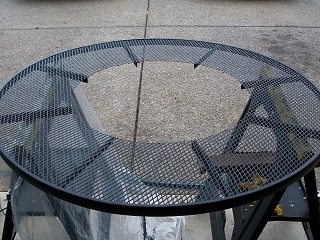 I welded the circular flat bar to the ends of the angle iron on the table adding back the rigidity I had cut away. Once all was welded up, I cleaned up the welds a bit and then painted the ring and welds with Wrought Iron Flat Black paint. I then slipped the fire pit into the hole and (luckily) it was a perfect fit. (whew). 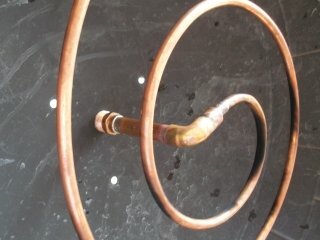 I took the malleable copper tubing and bent it into a coil and soldered a cap on the outer end, and a 1/4" to 1/2" reducer on the inner end. To the reducer I soldered in a short piece of 1/2" pipe, and then a 90 degree elbow to it. 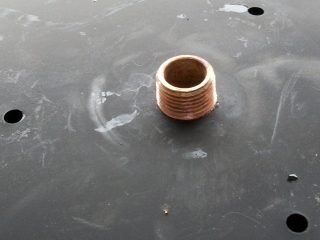 To finish off the coil for my gas fire pit table, I added a few inches of 1/2" pipe to a 1/2" threaded end. I drilled out the bottom of the fire pit pan to match the diameter of the threads so as to thread in the coil for stability. 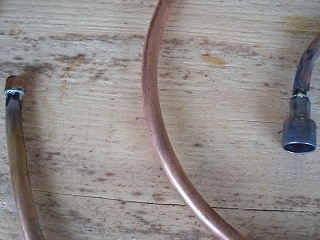 Once threaded in, I then placed a brass 3/8" reducer so the LP hose can be attached to the coil. 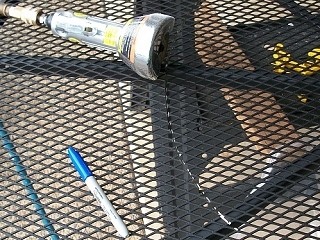 Flipped it over, placed it in the table, attached the propane and gave it a test. 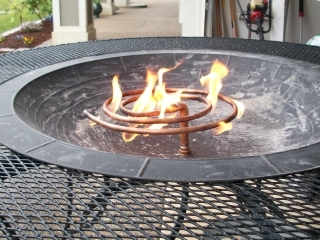 To me, I'd rather spend a day cutting and fabricating something like this fire pit and save $365.00 or more! The wife absolutely loves it, and I like it too!!! 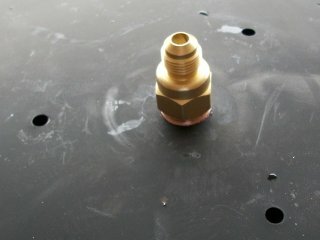 Update To Gas Fire Pit Welding Project: Tubing Hole Size and Spacing. It's been awhile since I built that table. It was all experimental at the time as to how far apart, and how big the holes were. I believe I started with just a few holes spaced evenly around the ring, at a relatively small diameter. I tested it, and increased the sizes and added a couple more holes over each test and eventually came to a flame I liked. Right now, with all of our rain, it's under a tarp until the good Lord decides to quit raining on us here. I'm so looking forward to barbecuing and getting out there around the table again at night with a nice glass of wine, bbq, and family! Do you like this project? Do you have comments or suggestions? Share it!